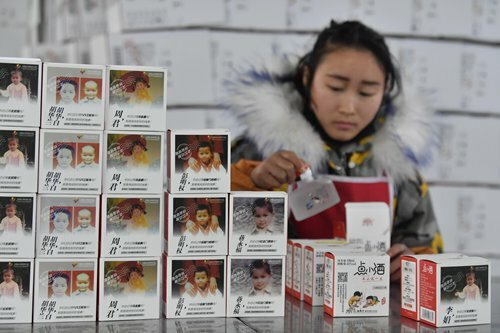 A Chongqing alcohol company recently released more than 110,000 bottles of liquor containing information about lost children on the package in the hope of finding leads for their safe return to their families. The move has won applause from most people while others suggested it was merely part of the company's marketing strategy to promote its products. 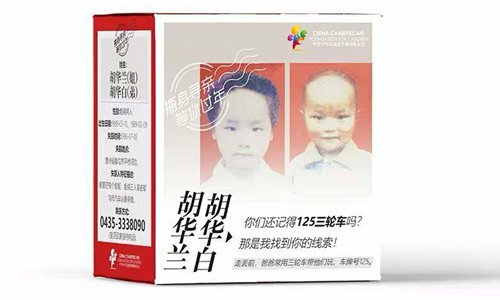 Chongqing-based Laoyuanzi printed the photos and names of 1,000 lost children including information about their physical appearance such as a scar. The company's online store says it put the information on 114,949 bottles of its products, Dianxiaojiu. The promotion is part of the "Baby Back Home" program under China Charities Aid Foundation for Children (CCAFC), a national public-raising foundation under the administration of China's Ministry of Civil Affairs. The foundation has also cooperated with bottled water brands and takeout box makers to expand the circulation of information about missing children. A bottle of Dianxiaojiu sells for 20 yuan ($3) and the entire profit —8.7 yuan — will be donated to the CCAFC, Ye Weiwei, who works for the foundation, told the Global Times on Thursday. The precise number of bottles has a literal meaning in Chinese. The company has pledged to undertake "one" charitable project "once" a year through "four" seasons. Nine, in Chinese, is a homophone for long-lasting. An employee from the company's online store told the Global Times on Thursday that many customers bought the special packaged wine just to support the charity project. More than 900 bottles have been sold since early December, said the employee. While most people praised the company's action, some suspected it was just a performance to gain reputation and sell products. The company's manager Xiao Dufeng said he was inspired by his friend who was deeply saddened after his child went missing. "If I only wanted to make money, I would not donate any profit to charities," Xiao told the China News Service. In the US, information about missing children has been printed on milk cartons since 1984 and now the information are pushed to cellphones through a system called Amber Alert, according to a report by the Atlantic. Although no official data is currently available, more than 43,000 families have registered with Baby Back Home in search for their children while some 38,000 individuals are looking for their families through this program as of press time.